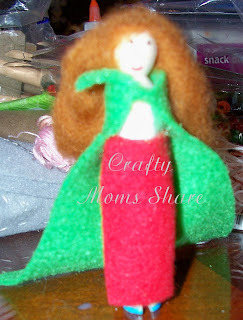 Well with St. Patrick's Day approaching we have been thinking Irish lately. So I thought this week we would share one of the Irish Cinderellas. We will explore the second one next Sunday since the Virtual Book Club for Kids will be on Monday (and Sunday is St. Patrick's Day). This week we will be looking at Fair, Brown and Trembling by Jude Daly. This version seems a bit softer than the versions I have read on-line at Sacred Texts and Authorma. 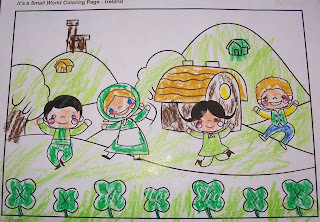 But before we explore the story, let us learn a bit about Ireland. 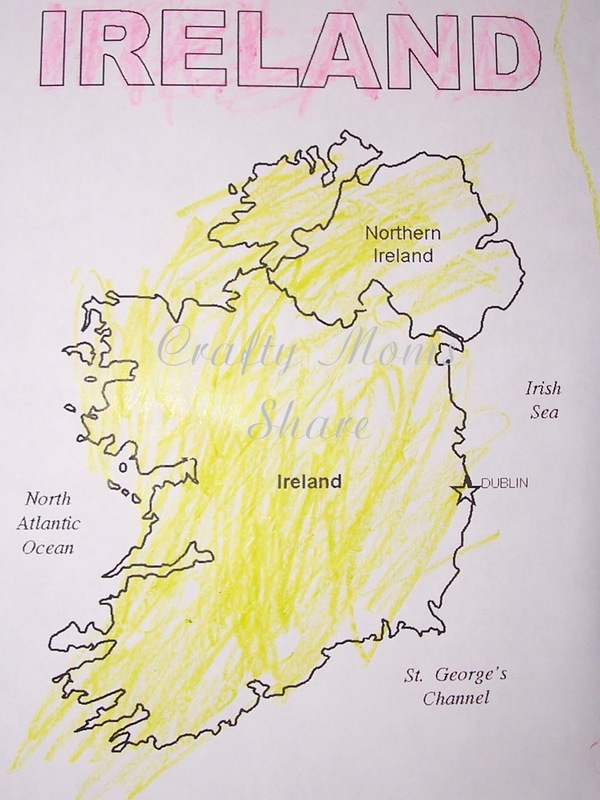 Ireland is an island to the northwest of continental Europe. It is the third largest island in Europe and the twentieth largest on Earth. 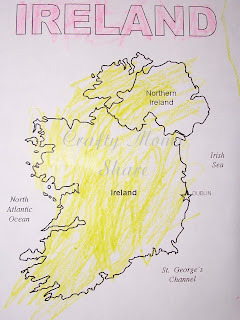 The island of Ireland contains two parts, the Republic of Ireland (which is usually referred to as Ireland) and Northern Ireland which is part of the United Kingdom. The island comprises of low-lying mountains surrounding a central plain with several rivers inland. Until the 17th century it was covered with thick woodlands, but is now one of the most deforested lands in Europe. 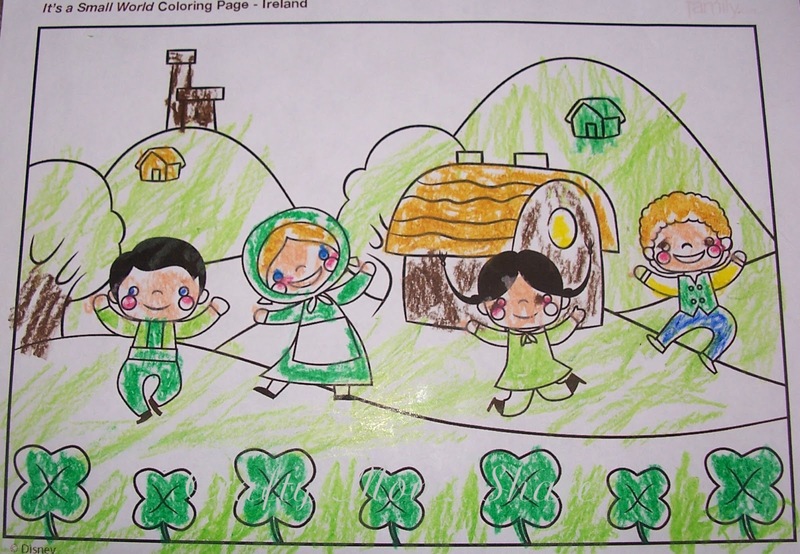 (Source) We will focus on the country of Ireland. The country of Ireland occupies about five-sixths of the entire island. It gained independence from the United Kingdom in 1922. It however remained a dominion within the British Empire. In 1937 it became Ireland (previously being called the Irish Free State) and in 1949 it became a republic and the remaining duties of the British monarch were removed. While Ireland is ranked among one of the wealthiest countries in the world, it was at one point one of the poorest countries in Western Europe. The country is mostly Christian with the largest percent being Roman Catholic. Now onto our story. The version I found in a picture book, does not have the same ending as the ones on-line. I will explain the differences along the way. 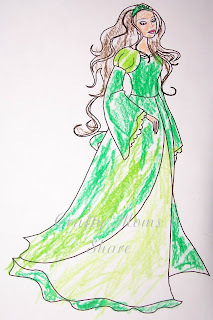 In the book version, the story starts with a widower and his three daughters, Fair, Brown and Trembling, who live in a castle in Ireland (well Erin, but that is Ireland). Fair and Brown go to church each week in new dresses, but they make the younger sister, Trembling stay home and do the cooking. The real reason they make her stay home is because she is more beautiful and they do not want her to be married before themselves since she is the youngest. One Sunday the henwife comes in and tells Trembling she should be at church and Trembling says she has nothing to wear and needs to do the cooking. 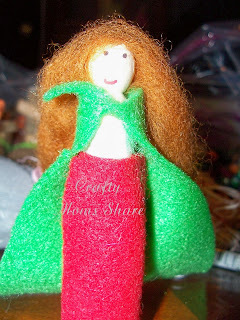 The henwife puts on her cloak of darkness and gives her the dress of her dreams--white as the snow with green shoes. She also gives her a snow white mare to ride. She tells Trembling not to enter the church and to leave as soon as mass is over. Trembling goes and turns heads, but follows all of the henwife's instructions. Several men try to catch up with her, but no one can. When the sisters return home she is back in her old clothes and the henwife had cooked, so they do not know a thing. They talk about the beautiful woman at the church and search for the same dress. The next Sunday after Fair and Brown have left for church the henwife comes and asks Trembling what she would like to wear this week. Trembling says a black satin dress and scarlet shoes and a mare so black and glossy she can see herself in it. The henwife produces all of this for her and Trembling goes to church the same as before. 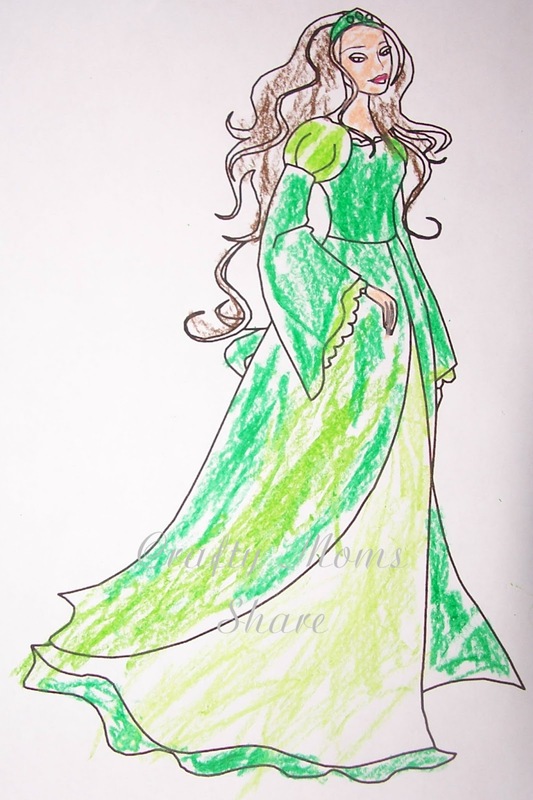 The third week, Trembling asks for a dress with a snow white bodice and rose red skirt with a green cape and blue shoes. Her mare this week is white with blue and gold diamonds on it. This week the church is full since word of the beautiful woman had spread far and wide. Princes from all over had come to have a chance to meet her. At the end of mass Trembling rushed off, but the Prince of Emania manages to grab one of her slippers. He claims he will marry the woman whose foot fits the shoe, however all the other princes say he must fight them for that right. First they decide they must find her. When the princes are approaching the castle of Fair, Brown and Trembling, Fair and Brown lock Trembling in a cupboard. Their feet will not fit into the slipper. The Prince of Emania asks if there are any other young women in the house and a faint voice from the closet says yes. Fair and Brown say she is just the girl who cleans the ashes, but the princes insist on seeing her. Of course the shoe fits perfectly and the Prince of Emania sees that she is the woman he saw at the church. Now the princes begin to fight for her hand. In three days, three princes challenge the Prince of Emania. The first fight is for nine hours and the other two are for six each. After that all the other princes decide he has won her hand and the wedding is planned. Trembling and the Prince of Emania are married and eventually have fourteen children and live happily ever after. Fair and Brown are put to see in a barrel with provisions for seven years and are never seen again. Now the on-line version mentions the father's name. A few details about the outfits are different. The ending however is very different. The wedding lasts a year and a day. When Trembling has her first child, she sends for her eldest sister, Fair to help. After Trembling is feeling better, she and Fair go for a walk by the seaside and Fair pushes Trembling into the sea and a whale swallows her. The whale spits her up on the beach the next day and a cow herder for the Prince finds her. She tells him to go home and tell his master that her sister threw her off the cliff and a whale swallowed her and the whale has enchanted her, so he will spit her up for two more days and swallow her again if her husband does not come to save her by shooting the whale with a silver bullet. The cow herder eventually does this (Fair first gives him a forgetting poison the first night) and the Prince saves Trembling. The Prince had sent for their father and he puts Fair out to sea in the barrel. 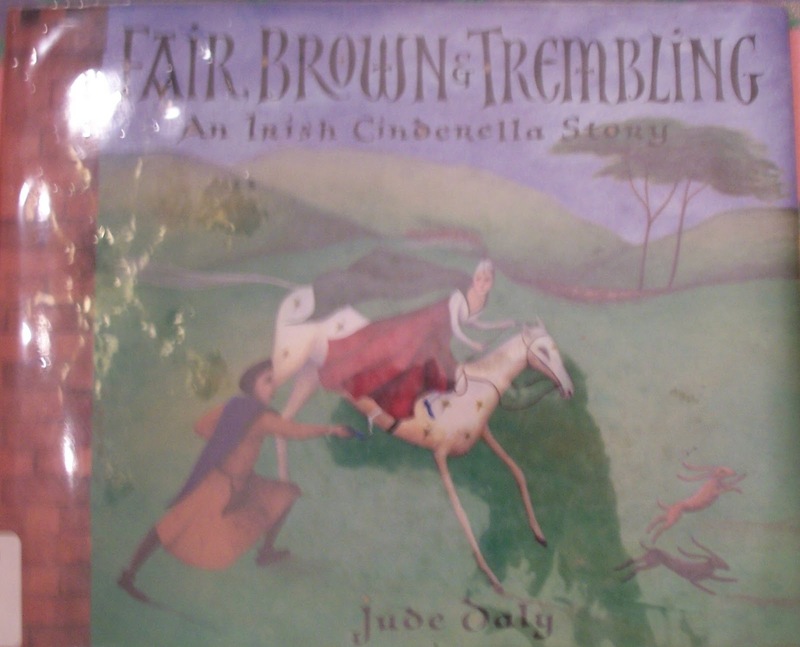 Trembling's second child is a daughter and they promise her hand to the cow herder. I have to admit this ending would probably scare Hazel a bit too much, so I'm glad the picture book did not have it. We did a few coloring pages for this one to go along with our doll. Hope you will join us for more Irish posts this week and our second Irish Cinderella next Sunday! Is next week "The Irish Cinderlad"? It's one of our favorites! What an interesting story - I'm intrigued by the different endings! 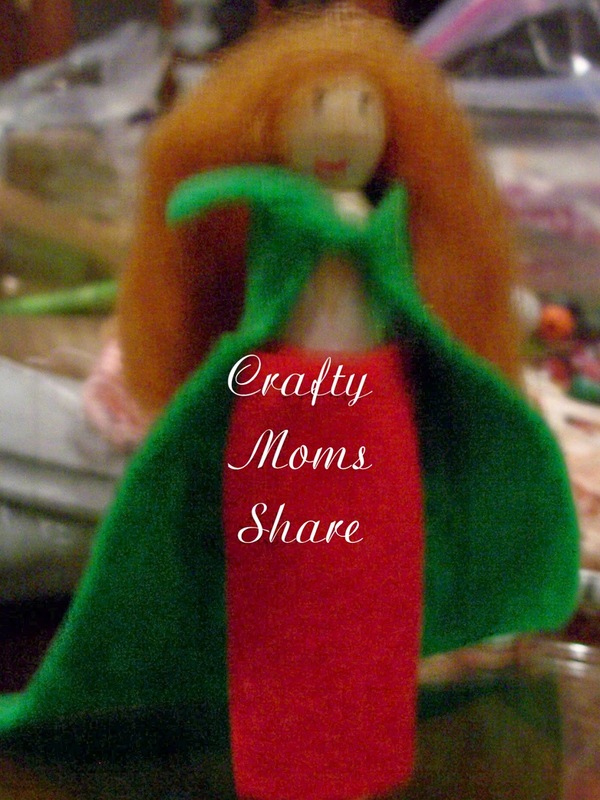 Thank you for linking up to the Creative Kids Culture Blog Hop! 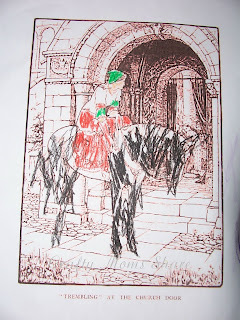 I read another Irish take on Cinderella in which the Cinderella character was boy! 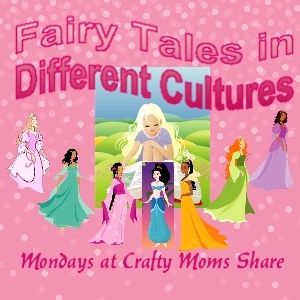 Thanks for sharing at The Children's Bookshelf.